Pope Francis admitted today that the lack of vocations in some parts of the Church can cause him to feel tempted to lack hope, but he says that it is a call to pray more fervently, as Anna prayed for the gift of a son, and was given Samuel. The Pope spoke of this today — and also of the sin of gossip — when he received in audience consecrated men and women celebrating their jubilee at the end of the Year of Consecrated Life. Tomorrow, the feast of the Presentation of the Lord and the World Day of Consecrated Life, marks the end of the special jubilee year. 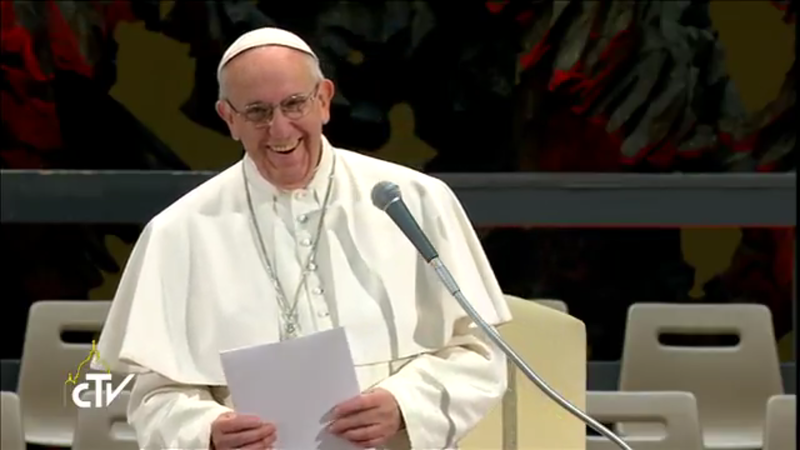 The Pope left aside his prepared text and instead spoke to the consecrated off-the-cuff. He first spoke about obedience, saying some consecrated persons give a witness of obedience that is prophetic. “There are men and women among you who live intense obedience, an obedience, which is not military, no, not this; that is discipline, something else – an obedience of donation of the heart. And this is prophecy,” he said. This obedience works against the “seed of anarchy, which the devil sows,” the Pope stated. Obedience can be hard, as Jesus’ was, but it prophetically shows people that “there is a way of happiness, of grandeur, a way that fills one with joy, which is precisely the way of Jesus. It is the way of being close to Jesus,” Francis assured. Pope Francis also spoke to the consecrated persons about living charity, first with those in their communities, and also by being close to those whom they serve. Consecrated life should lead “to closeness with people: physical, spiritual closeness, to know the people,” he stated. A threat to this closeness is what the Pope referred to —using an expression he has used on other occasions — as bombs of gossip. Finally, the Holy Father turned to the theme of hope.